GFNY World heads to the Caribbean for inaugural GFNY Republica Dominicana this Sunday April 7. 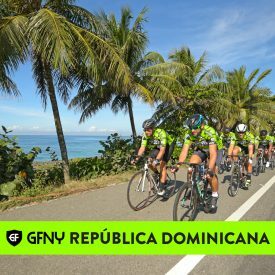 (NEW YORK CITY, April 5, 2019) – The Caribbean’s premier resort town of Punta Cana will host 1200 riders at the inaugural GFNY Republica Dominicana this Sunday April 7. GFNY Republica Dominicana will start and finish in the heart of Punta Cana. Its international Airport is just steps away from the major resorts and hotels of the area that will welcome riders from 25 nations this weekend in the first major cycling race to be held on the island. The long distance covers 150km with 973 meters of climbing and serves as a qualifier for the racer corral at the 2019 Campagnolo GFNY World Championship in NYC on May 19. The medium, non-competitive route covers 94km and 398 meters of climbing. The first 25km is predicted to go out at a fast pace as riders maximize smooth highway roads to warm up legs and take turns in pace lining. From km26 the route will head inland through rural villages with intense green hill views on one side and a back drop of the azure Caribbean on the other side. The rolling hills will allow for moderate intermittent elevations and a favorable tailwind will keep the peloton moving at a fast pace. Km63 marks the turnaround point and the most challenging section of the course as riders will start the return back into a head wind. Upon crossing the finish line, Punta Cana Resort & Club will host a beach party with live music and lunch for finishers, friends and family to celebrate the days’ achievements.